Knitamus will keep track of your place on a PDF page or photo for easy chart and row-by-row instruction highlighting. The chart view will even notice when you’ve gone back to work a section again, making repeats a breeze. Import any PDF pattern you like, or take a photo of a printed pattern you own. I hope you enjoy knitting with Knitamus! Help is available in the app via links to my website, the Knitphisticate group on Ravelry, and email. 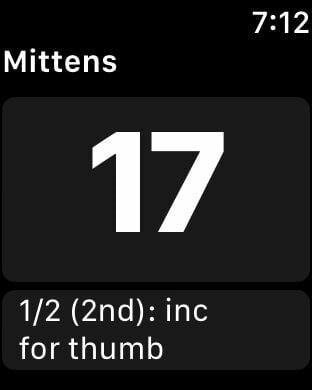 Knitamus includes an Apple Watch extension. On the watch, you can work on your most recent project, using the counter and viewing text notes. Many thanks to Churchmouse Yarns & Teas of Bainbridge Island, Washington, for the use of their pattern, 'Modern Wrapper', in the screenshots!